We want to leave a positive legacy for next generations, so we are 100% committed to improving our environmental performance. 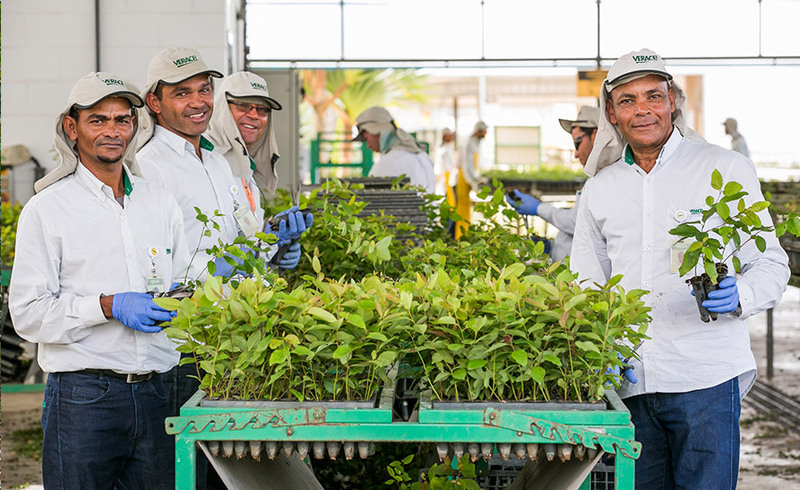 Environmental commitment is one of our business values and a key item in Veracel’s Sustainability Agenda. Continually seeking the best operational productivity indexes and high quality cellulose means to keep high levels of environmental performance. 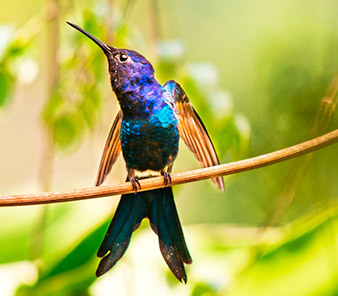 By knowing the potential and real footprint and being aware of our role in environmental conservation, we work in accordance with Brazilian legislation and adopt normative standards in our activities, and develop environmental education programs with our stakeholders, continuously discussing with communities to measure, evaluate and correct possible environmental footprint. 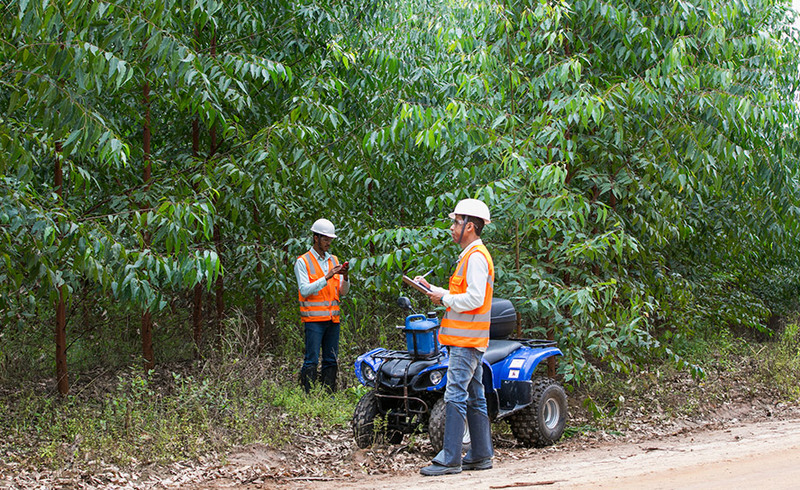 We monitor the environmental indicators of our industrial operations using the Daily Environmental Indicator (IAD, in Portuguese acronym), being possible to supervise all stages with water, emissions, liquid effluents and waste targets. The Jequitinhonha river, from where we collect the water used in our industrial units, is monitored monthly by a company contracted by Veracel, to check the water resource quality and river preservation. The control takes place at three points – the upstream (next to headwaters, before the Veracel’s water collection point) to the effluent release and two downstream (next to the sea, after the Veracel’s water collection point. 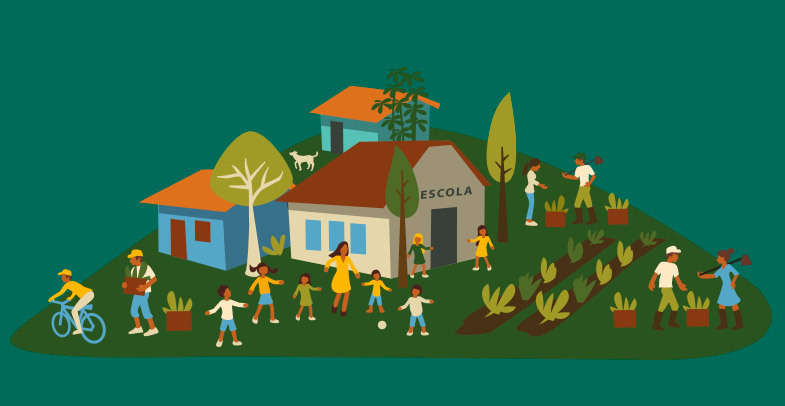 The water used by the Forest Nursery in our forest operations comes from a dam in the affluent of the Pedra Branca river and a tubular well in the Forest Nursery itself. This water is also used for forestry and harvesting activities at various points throughout the company’s area. e Instituto Estadual de Meio Ambiente e Recursos Hídricos (INEMA). Nos últimos 03 anos o uso específico de água na fábrica foi cerca de 25 m3 para produzir 01 tonelada de celulose. A meta para 2018 é reduzir o uso de água para no máximo 24 m3/tonelada de celulose. Para alcançar esse resultado a empresa vem investindo em melhoria de controle de processo para otimização do uso de água e identificando oportunidades de reuso de água de processo. A meta para 2020 é alcançarmos o uso de água abaixo de 23 m3/tsa. Not all points are used during the year as they depend on the projects where forest operations are carried out. The lower volume of water collection for forestry in 2017 was due to the reduction the plantation area compared to the previous year, which also affected the average m³/point/day, since the number of points used in 2017 was higher than in 2016. In the activities, harvesting and roads, the total volume was much smaller than the previous one because of the higher rainfall volume in the region in 2017 and the reduction of road provision compared to 2016. The Veracel’s Effluent Treatment Station (ETE, in the Portuguese acronym), where all the water used in the cellulose production process is forwarded to, has high efficiency of organic load removal (over 98 percent). The ETE has a continuous monitoring system and skilled technical staff which ensure the environmental control and the high quality of effluents released in the Jequitinhonha river. The organic load levels, nutrients, oxygen and pH, among other indicators, are monitored, meeting all the legal limits and quality standards. The volume of water used in forestry activities is relatively low compared to industrial operations’ one. Still, the water collection control is done based on notes made by the tank trucks’ drivers, enabling the calculation of the volume collected by each point. The water resulting from irrigation and cleaning processes in the nursery is sent to a waterproofed tank and used for irrigation of lawns and gardens when there is a need for emptying. has high efficiency of organic load removal (over98 percent). In 2007, we reached the best industrial solid waste recycling index in our history: 98 percent. We reduced this waste generation by 6 percent compared to 2016 level and sent them a significant smaller amount to industrial landfill: 83 percent less than the previous period. The positive results can be attributed to a number of factors involving this area management in the company. Waste produced by the cellulose plants, such as biomass ash, lime sludge, dregs and grits, has presents great potential for agricultural use due to the presence of mineral nutrients as well as the ability to correct soil acidity. The use of organic materials, such as sludge from the Effluent Treatment Station and the eucalyptus biomass, enables the closing of a cycle of reuse of organic matter and minerals in the soil. We aim to always seek alternatives to reuse and recycling of solid the solid waste generated in the plants and to move only the materials for which no alternative of economically viable use has been found to landfills. The total volume of limestone used as a soil acidity corrective in the Veracel forestry process has come from the corrective produced at the plant’s Waste Treatment Center since 2009. It has the calcareous waste generated in the cellulose production process as its raw material. In recent years, more than 90 percent of our energy has come from renewable sources, having black liquor as the main fuel, which is a by-product of the processes, followed by wood biomass of. We also sell part of the energy produced, contributing to the company’s revenue and reducing the overhead of the supply system. In 2017, we made 40 percent more energy available to the power grid compared to the level in 2016. The synergy between the Forest and Industrial areas was essential for the biomass availability for burning in order to increase the surplus energy generation for the market, a good business option for Veracel. *Improvements in the Recovery Boiler maintenance have resulted in higher equipment availability, reducing emergency stops and, consequently, the fuel oil consumption. *The main cause of the increase in the purchase of electric power was the maintenance of Turbo Generator valves, which has demanded extra power for the operations in the plant and the chemical plant (EKA). *In previous years, we considered the following machinery: harvester, forwarder, wood transport trucks and wood loading cranes. Tank trucks and trains and others are not included. By being aware of the importance of the atmospheric emission management and control, we continue to improve our processes on order to minimize our footprint. 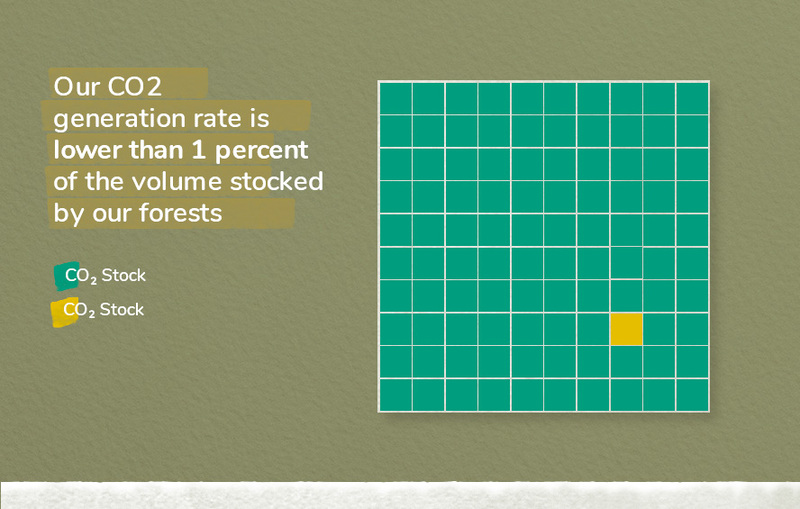 The good news is that our CO2 generation rate is lower than 1 percent of the volume stocked by our forests. The atmospheric emission control at Veracel is carried out accurately. Instruments installed in fireplaces measure the emission quality continuously in order to meet all the air quality standards. Initiatives for landscape management, sustainable forest management and reduction of the use of chemical products are practices that contribute to minimize the atmospheric emission impacts. Learn more about these and other initiatives in Landscape and Biodiversity chapter. It is common for people who visit us to think it’s smoke, but this is water vapor from the production process. The variation of the annual refrigerants gases consumption related tothe company’s cooling system maintenance needs. One of the potential industrial impacts is the odor generation from the sulfur compounds, which are more noticeable when there are maintenance activities or some problem in the processes. Although this odor does not cause any health damage, we have an Odor Perception Network (RPO, in Portuguese acronym) made up of volunteers, residents in the plant’s neighborhood. In 2017, we ha15 odor complaints caused by gases deviations during isolated events as well as failures in some critical instruments. All these deviations were mapped and repaired during the General Maintenance Stop in October, and we were able to operate normally again. We work continuously to avoid odor generation and intend to recover the environmental excellence in this filed, obtained previously in 2015 with zero odor claim.